84 MMS September 2017 mmsonline.com FEATURE accident. Machining strategies can transfer from job to job, and similar features often appear on very different parts. "It's all about putting the right cutting tool in a good situation where it can thrive" in a particular geometry and material, he says. Modern CAM software makes it relatively easy to store best-practice data for any future job that might benefit, and to see what exactly will happen before tool ever meets metal, he says. To that end, the shop maintains a database of parameters that work for specific cutters in specific materials. 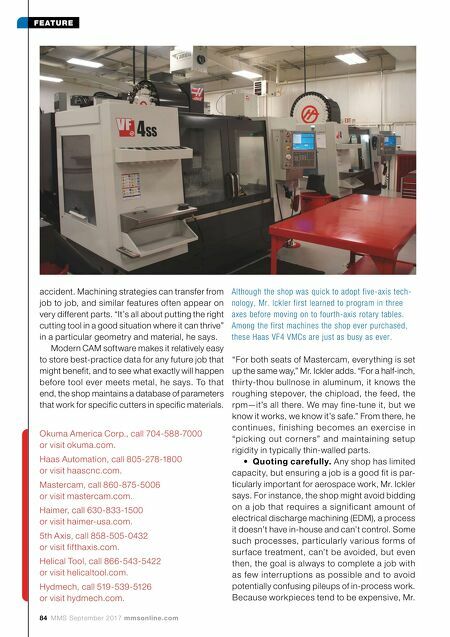 "For both seats of Mastercam, everything is set up the same way," Mr. Ickler adds. "For a half-inch, thirty-thou bullnose in aluminum, it knows the roughing stepover, the chipload, the feed, the rpm—it's all there. We may fine-tune it, but we know it works, we know it's safe." From there, he continues, finishing becomes an exercise in "picking out corners" and maintaining setup rigidity in typically thin-walled parts. • Quoting carefully. 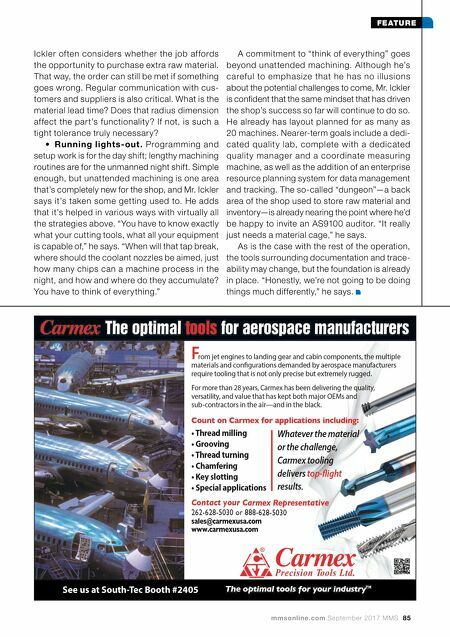 Any shop has limited capacity, but ensuring a job is a good fit is par- ticularly important for aerospace work, Mr. Ickler says. For instance, the shop might avoid bidding on a job that requires a significant amount of electrical discharge machining (EDM), a process it doesn't have in-house and can't control. Some such processes, par ticularly various forms of surface treatment, can't be avoided, but even then, the goal is always to complete a job with as few interruptions as possible and to avoid potentially confusing pileups of in-process work. Because workpieces tend to be expensive, Mr. Although the shop was quick to adopt five-axis tech- nology, Mr. Ickler first learned to program in three axes before moving on to fourth-axis rotary tables. Among the first machines the shop ever purchased, these Haas VF4 VMCs are just as busy as ever. Okuma America Corp., call 704-588-7000 or visit okuma.com. Haas Automation, call 805-278-1800 or visit haascnc.com. Mastercam, call 860-875-5006 or visit mastercam.com. Haimer, call 630-833-1500 or visit haimer-usa.com. 5th Axis, call 858-505-0432 or visit fifthaxis.com. Helical Tool, call 866-543-5422 or visit helicaltool.com. Hydmech, call 519-539-5126 or visit hydmech.com.